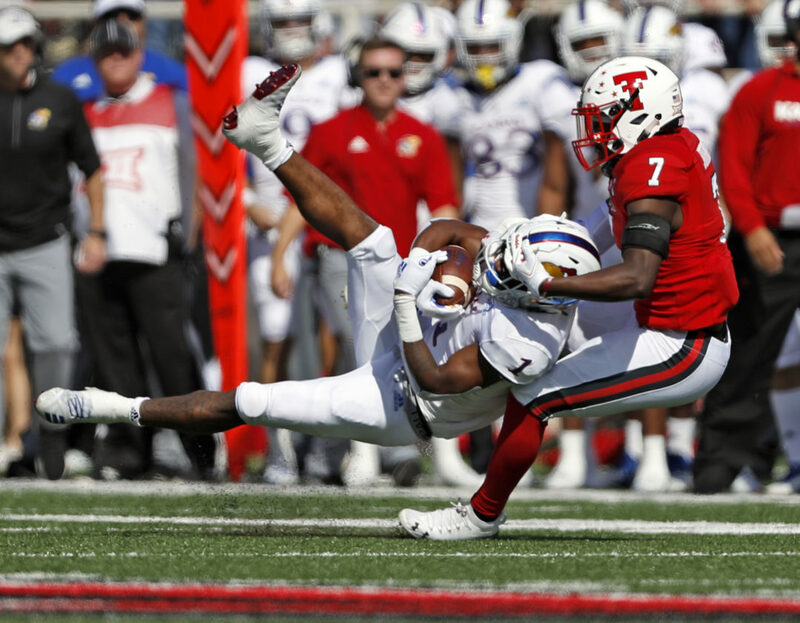 Texas Tech's Jah'Shawn Johnson (7) tackles Kansas' Pooka Williams Jr. (1) during the first half of an NCAA college football game Saturday, Oct. 20, 2018, in Lubbock, Texas. 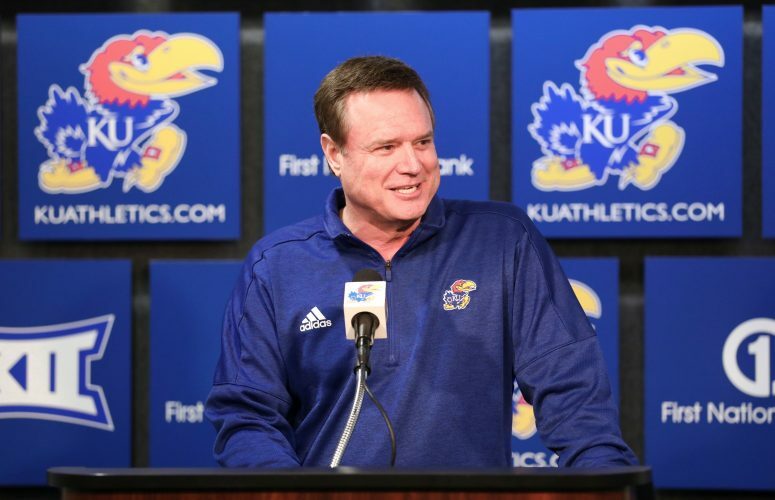 Lubbock, Texas — At various stages of the fourth quarter during another Kansas football loss, some heads on the Jayhawks’ east sideline hung low. A few Jayhawks, with their hands on their hips, watched in disbelief. Others stared defiantly into the late afternoon sun, doing their best to stomach the final minutes of a 48-16 defeat at the hands of Texas Tech. All of the looks were suitable for a day on which the KU defense gave the ball to the offense 10 or fewer yards away from the end zone twice and the Jayhawks still finished their trip to Jones AT&T Stadium with only three points off their three total takeaways. 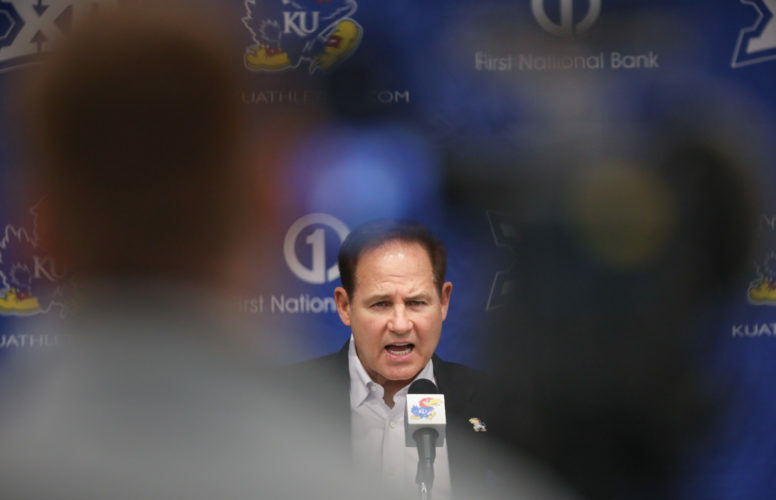 The Jayhawks’ offense, led by head coach David Beaty instead of fired offensive coordinator Doug Meacham for the first time this season, went kaput out of the gate, in front of a crowd of 54,402. 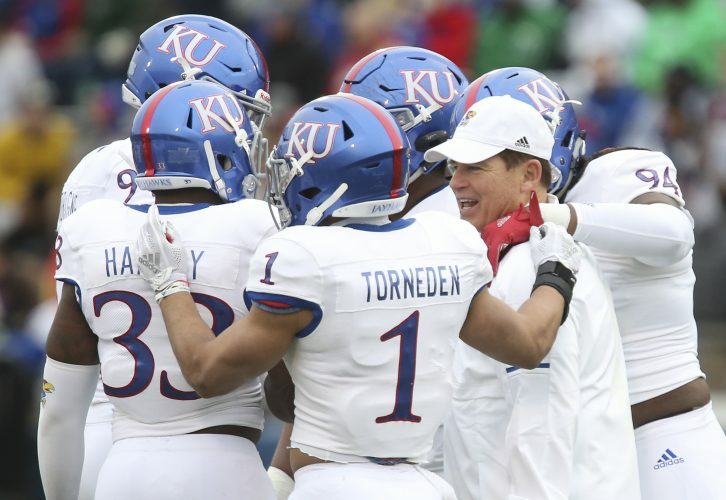 KU freshman cornerback Corione Harris delivered the game’s first big play, stripping Red Raiders senior receiver Zach Austin as he tried to extend for extra yardage after a catch. When the ball came loose, junior Hasan Defense easily snagged it, setting the KU offense up with a two-yard field. An illegal formation penalty on KU negated what would have been a pass interference call on starting quarterback Peyton Bender’s third-and-goal throw to senior Jeremiah Booker in the back, left corner of the end zone. With offsetting penalties calling for a replay of the down from the 1-yard line, Bender handed the ball off to Khalil Herbert (eight carries, 42 yards), only to see the junior running back stymied in the backfield by Dakota Allen for a two-yard loss. KU settled for a 20-yard Gabriel Rui field goal to tie the game at 3 apiece, instead of truly capitalizing on the takeaway with a touchdown. A Joe Dineen fumble recovery in the opening minutes of the fourth quarter, with KU already facing a 34-9 deficit, didn’t even amount to some morale-boosting points for the Jayhawks’ offense. Dineen secured a fumbled exchange by quarterback Alan Bowman at Tech’s 10-yard line. But after Bender hit Daylon Charlot for a five-yard gain on 1st and goal, Douglas Coleman picked Bender’s next throw off in the end zone. Unlike what transpired after KU’s defensive takeaways, however, the Red Raiders turned their good fortunes into an 80-yard TD drive that buried the Jayhawks, 41-9, with 9:38 remaining. Just how improbable is it for an offense to get three measly points on two extremely short fields? Bender, who took every snap for KU (2-5 overall, 0-4 Big 12), finished with an 18-for-41 passing day, with 221 yards, two touchdowns and an interception after a lethargic start. He addressed the feeling that accompanied the empty short fields off turnovers. The Red Raiders (5-2, 3-1) didn’t really begin to create separation with their offense until late in the second quarter, when they added 14 points in the final 4:26 before halftime. But the KU offense only covered more than 19 yards of turf on one of its eight possessions before intermission. 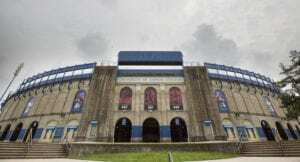 On KU’s first offensive series, when Beaty made his 2018 debut as the team’s offensive coordinator, a seven-yard Pooka Williams rush to open the drive was followed by four pass attempts, only the first of them completed (a 13-yard reception for Stephon Robinson) by senior quarterback Bender. In-Bender’s-face pressure from Tech forced a couple of incompletions, one of which could have been picked off had Sims not briefly become a defensive back, keeping the Red Raiders from intercepting the hurried throw. The Jayhawks’ second series only lasted five plays when Bender overthrew an open Sims deep down the left sideline on 3rd and long. What had all the makings of a productive offensive series to open the second quarter blew up inside the Red Raiders’ 5-yard line when freshman back Williams (16 rushes, 70 yards), whose multiple gains helped put KU in position to score, fumbled the ball as John Bonney hit him, allowing Allen to recover and resulting in the Jayhawks’ fourth lost fumble of the season. The giveaway didn’t directly lead to Red Raiders points, as KU’s defense responded with a three-and-out, but the blown chance certainly seemed to carry a cumulative effect for the Jayhawks in their fourth consecutive loss, the 14th straight Big 12 setback for fourth-year head coach Beaty, whose overall record dropped to 5-38 overall and 1-30 against conference competition. The half concluded in perfectly miserable fashion, too. After Hasan Defense picked off a deep Bowman pass, giving him and the unit KU’s second takeaway of the game, the junior defensive back returned his pick 37 yards, giving KU’s offense one last shot at Tech’s 41-yard line with 10 seconds left until intermission. Instead, at Tech’s 41-yard line with 10 seconds left before halftime, Bender threw an incompletion to Khalil Herbert and Williams ran for eight yards to close the second quarter. Though the third quarter concluded with KU’s first touchdown of the road loss, a 30-yard gem of a connection between Bender and Sims on fourth-and-7, the possessions that preceded it went three-and-out when the Jayhawks needed at least a semblance of something positive offensively in order actually challenge the Red Raiders. Beaty had a hard time getting over the muddied offensive start and, of course, lack of points off takeaways. While KU’s offense faltered, Tech eventually found a rhythm in Bowman’s return. The true freshman went 34 of 46 through the air for 408 yards and three touchdowns, with the one interception. 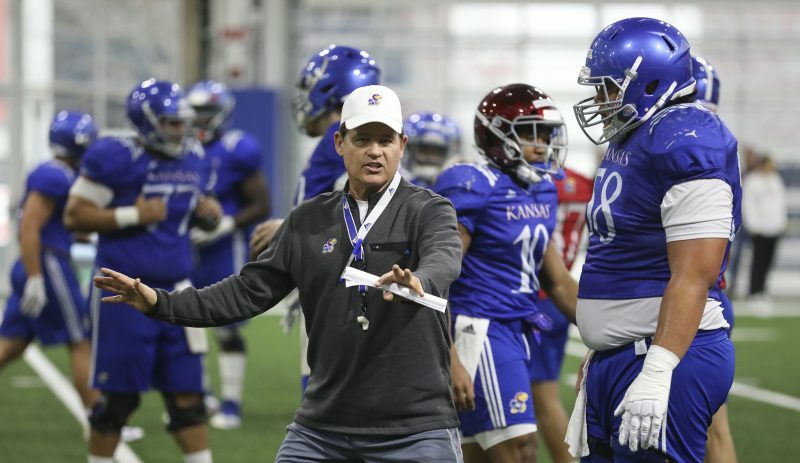 He often feasted by finding too-tall receivers for KU’s secondary to cover, such as 6-foot-5 Antoine Wesley (nine catches, 155 yards, TD) and 6-6 T.J. Vasher (five catches, 79 yards, TD). KU returns to Lawrence next week to face TCU (3-4, 1-3).